Just before Christmas, myself and Kristin Knox (aka The Clothes Whisperer) teamed up with Amy Brandon and ran riot at vintage store D&Me in Kensington. The idea behind this editorial is that of a little girl playing "dress up", albeit in some rather awesome and expensive vintage attire! D&Me was an amazing location. 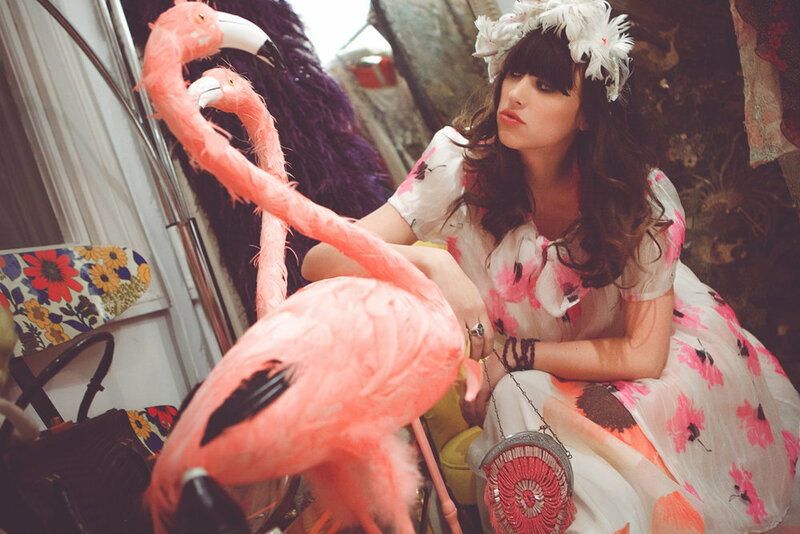 The stunning clothes and endless supply of props (I never expected a location to have a ready supply of flamingoes!) all added to the styling of the shoot. It was also nice to be somewhere warm when all outside was cold and windy! It's definitely about time I got booked for a shoot in the Maldives I reckon! Anyway, I hope you like the images as much as we enjoyed shooting them. Expect to see a lot more collaborations between myself and the Clothes Whisperer in 2012!